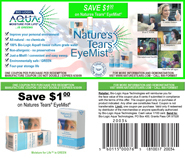 Natures Tears® EyeMist® - What is good for Dry Eye? What is good for Dry Eye? Dry eye are experienced as itching, burning, irritation, eyestrain, headache, and/or a "grainy" sensation. The ultimate cause is over-concentration of salt (electrolyte), due to moisture (water) loss in the tear film's aqueous layer. When moisture is depleted, electrolyte and other substances become over-concentrated and discomfort results. When the electrolyte is properly diluted, the discomfort vanishes. Researchers have long known that the simplest and most natural way to soothe dry irritated eyes is to add two-to-five-billionths of a liter of moisture (water) to the aqueous layer. However, a commercially viable method of achieving this was not developed until 2002. In that year, Bio-Logic Aqua Research developed a system that emulates the air's natural humidity by applying moisture as an ultra-fine, pH-balanced (<7.0) water mist around the face rather than in the eyes. The mist droplets penetrate the lipid layer like vinegar penetrates salad oil: The oils parts, the droplets pass, and the oil closes. This new hydrotherapy discovery, for the first time, enables individuals to take personal control over dry eyes through a simple and safe daily (or even hourly) moisture supplementation regimen. Prior to 2002, the solution to dry irritated eyes had been formulated eye drops delivered with an eye dropper. Eye drops pose several drawbacks: (1) They are artificial chemical formulations, (2) eye droppers may be difficult to use, unsanitary and even dangerous, (3) eye droppers place far too much liquid into the eye, (4) drops are ineffective for many people, and (5) eye drops lack the pure, titratable (minute dosage) water required by a dehydrated aqueous layer. The primary benefit of formulated eye drops is trapping and sealing existing tear film moisture to slow moisture loss. Drops accomplish this most effectively when the tear film's moisture content is at full capacity. For best results, therefore, an ultra-fine water mist should be applied immediately before eye drops. A good eye mist may also be applied between eye drop applications, or when eye drops are not convenient. Bio-Logic Aqua Research has developed a new category hydrotherapy product that is (1) the only eye care product applied as a mist, and (2) the only eye care product containing 100% pure and safe, all natural, pH-balanced (6.49), mineral correct, tissue culture grade water ideal for tear film penetration.